Sneaky giant swallowtail caterpillar browsing in rue. Discovered the next morning that the rue plant I brought home also had a caterpillar! It was big and had black and white blotches. I knew right away that it was a giant swallowtail caterpillar, much like the one I saw back in May at Possum Trot Tropical Fruit Nursery. The caterpillar begins its transformation into a chrysalis. 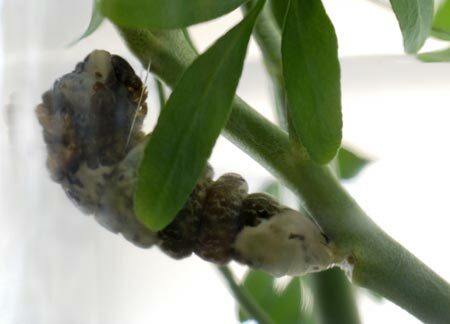 The caterpillar had a good appetite and devoured several branches of rue leaves for the next few days. 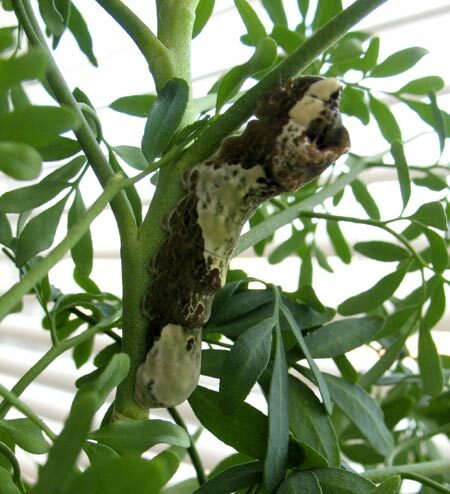 (Giant swallowtail caterpillars feed only on citrus and rue leaves, so if you want them in your yard, grow rue.) Several days later the caterpillar looked different. It was hanging from a branch with what looked like two strands of monofilament connected to just below its head area, and its tail was firmly wedged against a stem. It had begun its transformation into a chrysalis! The following day the transformation was complete. Its skin had turned dark brown and rough. 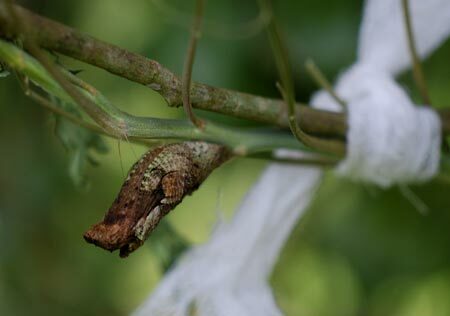 The chrysalis looked like a bit of a brown tree branch — protective camouflage. 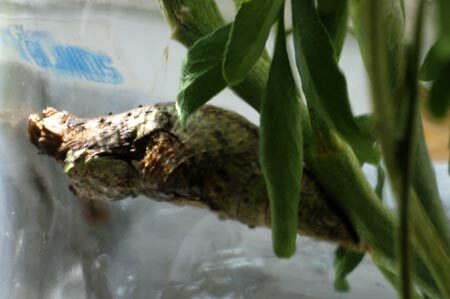 Chrysalis, day 5. That knob of old wood doesn’t look like it would have anything to do with a butterfly. I carefully clipped the branch it was attached to and put it into a large jar, and with a piece of cheesecloth on top so air could get in. The plan was to take it to a good place with lots of flowers. The giant swallowtail butterfly that would emerge would need sustenance in the form of nectar. In my neighborhood, there aren’t that many things blooming this time of year, and come to think of it, I haven’t seen any butterflies around. Chrysalis, day 7. Released into the wild. It has acquired subtle green markings. Farmer Margie offered to host the chrysalis, and I brought it to Bee Heaven Farm. We scouted for a good spot. It couldn’t be near the ground, where something might eat it, and it had to be close to the farm house, where it would be easy to check. Finally we picked a shrubby tree near the kitchen door, and tied the chrysalis to a branch with the cheesecloth from the jar. The butterfly is supposed to emerge after 10 to 12 days. Margie promised she would check the chrysalis twice a day. Hopefully she’ll be there with a camera when the butterfly emerges. I’m going to buy some Rue and add to my butterfly Garden , The giant swallow tail is really special , Krome and what street ? Margarita’s stand is at 155 St and Krome, on the east side. Saw she had two rue plants left last week. Rue grows well from cuttings, likes sun, and doesn’t need much water once it’s established. Read on the internet that some people can get a skin rash handling it, but I’ve never seen that happen. Lithuanians love rue and plant it in their gardens.